Did you know that sunbathing can make you blind? This is according to an article which appeared in The Sunday Telegraph on May 16th 2004 based on a study carried out at the University of Wisconsin, USA. A team, led by Dr Ronald Klein, found that adults aged below 40, who had regularly been exposed to the sun for more than five hours a day over a number of years, were more than twice as likely to develop serious eye damage (age-related maculopathy) than those who spent less than two hours each day in the sun. They also found that the use of hats and sunglasses reduced the risk by 50%. It is sensible therefore that everyone should protect their eyes from excessive sunshine. 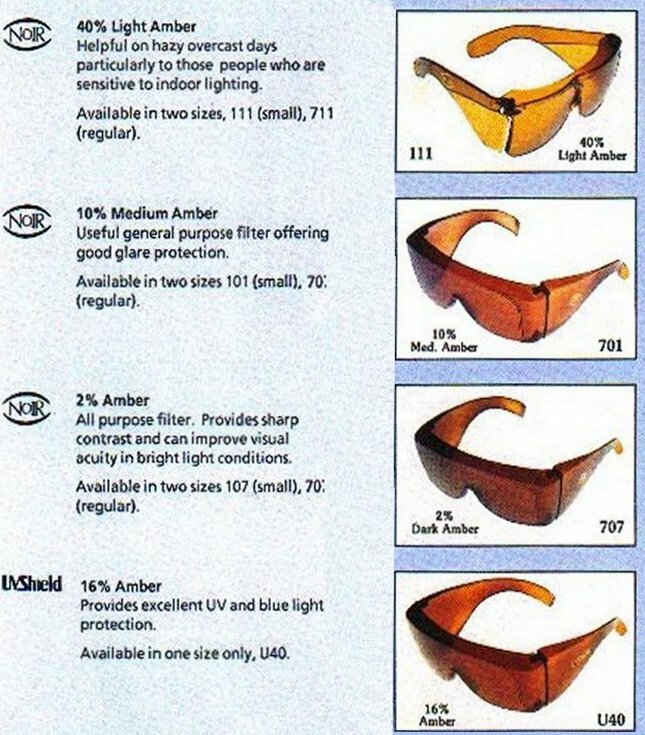 When you buy plane sunglasses according to BS EN 1826:1997 the filter category information must be provided to you so you know if your eyes are properly protected. All lenses used outdoors should provide protection from UVA and UVB no matter how dark the tint. Lenses should not be too dark as they enlarge the pupil unnecessarily which reduces the depth of field and consequently the quality of vision. Children with pathology may need tints for constant wear such as pre-tinted photochromic lenses although they may be psychologically unacceptable if too dark. Children whose cataracts have been treated often do well with a UV absorbing 30% light transmission factor (LTF) neutral tint. Albinos may need a 20% LTF tint, corneal dystrophy sufferers often prefer tints as dark as 5% while achromotopes often prefer red or brown tints. Patients with retinitis pigmentosa or macular dystrophy need filters that cut out light below 520nm. The President of the European Sunglass Association, Rod Lane, has called on the government to make sunglasses compulsory in schools to protect young eyes from harmful UV rays. It has been shown that by the age of 18 the average UK child has absorbed half of the total amount of UV it will absorb in its lifetime. The sun causes glare and the most effective means of control is the use of tinted overspecs. Tinted overspecs protect your eyes from excessive bright light from all angles  not just in front as with ordinary sunglasses. There are many different types available some of which are depicted to the left. The top three are to be worn over your own spectacles while those at the bottom are in the form of more normal sunglasses. Tinted overspecs are rather like sunglasses that can be worn over your normal spectacles. They have optical quality lenses which absorb all harmful ultra-violet rays, protection at the top and wide side-shields to eliminate rays from all directions. They are particularly beneficial to those over the age of 50 and low vision patients, although anyone with glare problems gain comfort too. To select the correct type of tinted overspecs you need the correct type of advice. Jennifer Brower is fully qualified in low vision and very experienced in the dispensing of these very useful vision aids and can help with your enquiries. Just email using the address below. By viewing the above diagram you may see that light consists of useful vertical light and glare causing horizontal light. When the sun's rays reflect off a shiny surface such as water, snow or wet roads your vision can be impaired and discomfort caused. 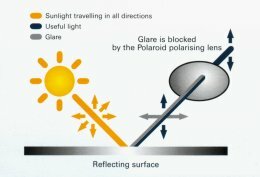 Polarising lenses consisting of a film of vertically orientated iodine crystals can cut out the glare creating horizontal polarised or reflected light. For Polaroid wearers this results in improved vision and greater comfort. Polaroid lenses also cut out the sun's harmful UVA, UVB and UVC rays which can cause permanent harm to the eyes. The lens is available in a range of colours including amber, grey, brown and magenta. These overspecs and sunglasses absorb the harmful ultra violet rays. VAT will not be charged if you registered partially sighted or blind. Recorded delivery postage and packing to the UK from £4.95.